Seventeen years ago today, I fell in love again. My heart had been broken a decade before. So to be seduced again, at last, made me appreciate that much more how precious and fragile such a relationship can be. I don’t know what made me take the Tube that morning to buy tickets to Highbury for the derby between the Arsenal and Queen’s Park Rangers. Sitting with my head pitch-level in the first row of the Clock End, I saw the action mostly through the goal netting. Tossing the ball back into play (there weren’t multiple game balls or ball boys) and being on the big screen as I did so was a thrill, but the rush of energy when John Jensen scored was what grabbed me, giving me an ecstatic sensation that made me an addict on the spot, a moment as powerful as being struck by Cupid’s arrow. I was sixteen when the Cosmos left me and though I played and coached in the years after, the passion I felt for them was just another childhood memory. But on New Year’s Eve 1994, I fell for the Arsenal, the love of my sporting life. If it hadn’t been for that day, I don’t know if I’d have been as excited as I was in the spring of 1996, when top-flight soccer returned to Giants Stadium with the MetroStars. Although neither the atmosphere at the Swamp nor the quality of play could compare to what I witnessed at Highbury, I quickly became a soccer bigamist, always wondering what I would do if my two loves met face-to-face. It was all conjecture until this summer, and fortunately the result was ideal. Neither side lost but winning the Emirates Cup surely meant more for New York than it would for the Arsenal. I can appreciate the cynicism of fellow New York soccer fans who saw the Emirates Cup as an unnecessary distraction, as far less important than, say, the Open Cup, though I shared their disgust with management’s disrespect for our nation’s domestic cup. If the New York Giants found the Open Cup worth leaving the American Soccer League in 1932, the Red Bulls ought to fight for it in 2011. So while winning the Open Cup or MLS Cup would doubtless mean so much more, seeing Thierry Henry lift the Emirates Cup wearing a New York shirt had special value to me with my dual allegiance. And that makes the news that our captain will play on loan this winter in England like one last gift for me this holiday season. Unlike the LA stories of Beckham wanting to risk injury with Milan in order to prove something to his country or Donovan flirting with Toffees in order to prove something to himself, Henry has nothing to prove. With his Highbury flat and daughter in London, it’s good that he keeps fit in training with the club that made him famous. And now that injury and the African Nations Cup leaves the Arsenal with a temporary void to fill, his joining the squad on loan doesn’t compromise his commitment to New York or create any controversy. 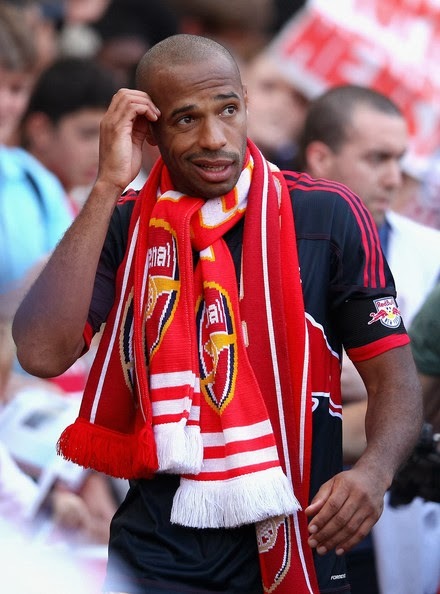 On the contrary, while the loan deals of Beckham and Donovan to play for Eurosides in the MLS off-season threatened to make their teams and the league look second-rate, Henry’s loan to Arsenal flatters team and league. I hope my fellow New York soccer fans share my sense of pride as Gooners celebrate the return of their King. The icon is more than just a statue. He can still play at the highest of levels, but his home is now New York. His goal is not to win a title or indulge nostalgia, but to help the club he loves while he can, before he gets back to the project he’s committed himself to, to bring at last a Major League Soccer championship to New York. I sympathize with his desire to not so much serve two masters as love two clubs at once. Henry’s spell back in an Arsenal shirt, provided it proves injury-free, is something to be proud of while so much else about this club leaves fans bitter and frustrated. The recent comments from President of Business Operations Chris Heck serve as a painful reminder that disquiet and mistrust from the fanbase is perhaps more justified than ever. Despite enjoying our Cathedral of the Beautiful Game, there’s still an awful lot to fix before we can be sure our local club will survive much less thrive. You have to reach a “perch” before you can claim you want to stay there. This franchise has been haunted by the ghost of Cosmos past since its inception. This year saw the threat of Cosmos future but neither a clothing line nor a nightmare exhibition at the Theatre of Dreams made them a reality. But reality often struggles to compete with fantasy and the Red Bulls front office would do well to learn this lesson and recognize that they have their work cut out for them still before they can claim to be a major presence on the overcrowded local sports and entertainment landscape. 2011 will doubtless go down in the annals of New York soccer history as a year of great promise that ended in disappointment. With what the Mayans hint may be in store for the world in 2012, we might well be headed for a most eventful year. Here’s hoping that Henry will have a successful spell back with the Arsenal and will come back to the Red Bulls inspired to lead us to glory. Anything less than a title could prove catastrophic. This love we share is fragile and easily lost. So as we recall auld lang syne, let’s take a cup o’ kindness yet, cherish what we have, not let the fools ruin what we’ve come to love, and let’s make sure the best is yet to come.